Footage that one of our photographers took today. 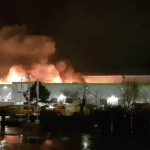 Following yesterdays Ocado warehouse setting ablaze firefighters have battled for nearly 40 hours to settle the blaze, however, tonight it has taken a turn for the worse. Walworth Industrial Estate is gridlocked in all directions and businesses in and around Walworth Business Park are being evacuated due to the risks. The scene is no longer treated as a ‘major incident’ and roads around the site will start to re-open. Firefighters countiune to work to secure the safety of the site. 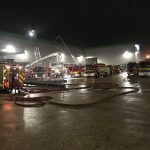 Overnight emergency services had continued their work on the Ocado scene making the scene more safe for those around it. Hampshire Fire and Rescue are also removing the possibly harmful chemicals from the ammonia tanks outside the warehouse. The cordon remains in place and is set to be removed later today. More updates follow. The evacuation zone of 500m remains in place overnight while emergency services maintain the situation in the Walworth Business Park. 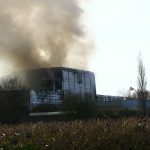 Further information will be available in the morning says Hampshire Fire and Rescue. 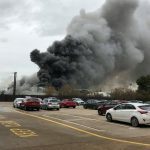 Hampshire Fire and Rescue have released a statement as follows; Deputy Chief Fire Officer Andy Bowers said: ” We have a risk of a toxic release or a large cylinder explosion. 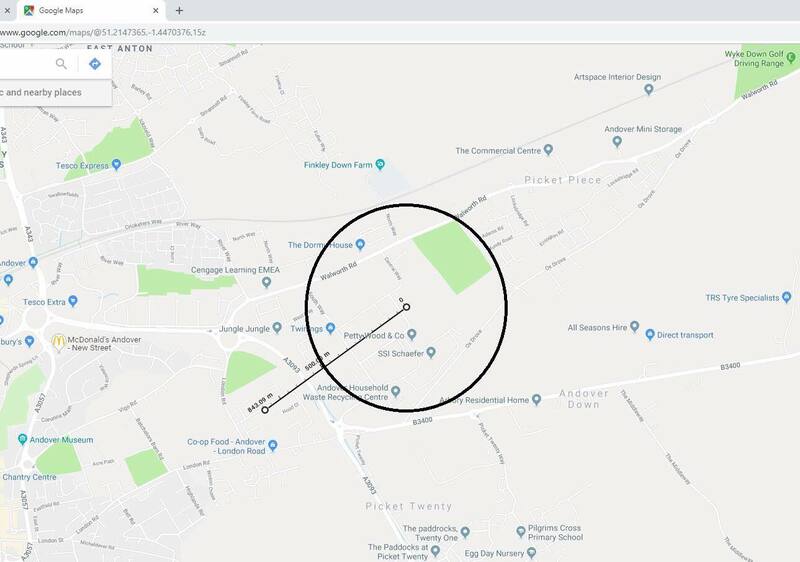 The following properties are being evacuated, Bailey Close, Mundy Road, Adams Road, Oxdrove, Strapp Road, Chaplin Way, Arrington road, Walworth Road. 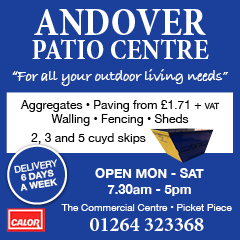 Police are urging Andover to keep windows and doors closed due to potential environmental risk. Residents of Picket Piece have been told to leave their homes without direction according to a resident of Picket Piece. Debris has been seen falling from the sky in St Mary Bourne. Reports suggest that the cordon is in place for around 1 mile. A family from Winchester can see the smoke cloud from their home. 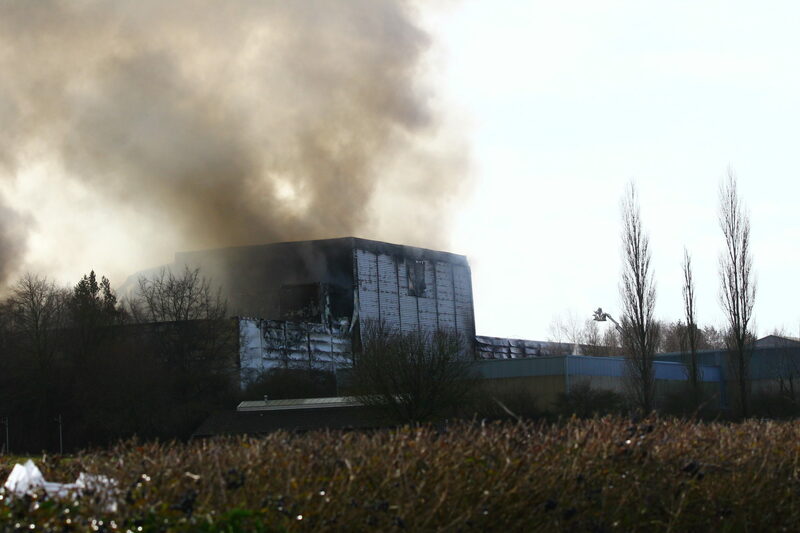 The thick black smoke plume can be seen by the eye for miles and even witnessed moving across Whitchurch. Reports suggest Walworth Business Park and Picket Piece have been evacuated due to environmental issues. More than 200 firefighters have attended the scene to tackle the ‘aggressive’ blaze. The blaze has been on-going for nearly 48 hours. A Whitchurch resident told Andover and Villages that they saw a ‘huge’ black cloud travelling across the town. The fire has seemed to have started again according to reports. 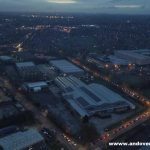 I have seen various posts from Augusta Park residents and others concerned about the smoke cloud from the Ocado fire on the Walworth business park. Test Valley Borough Council has Environmental Health officers on the ground and the air is being frequently monitored. We have spoken to Hampshire Fire and Rescue Service and their advice remains to keep windows and doors closed in areas affected by the smoke. Over 200 firefighters have attended the scene so far to tackle the blaze. My thanks go to them as well as the other members of our emergency services for the 24/7 job they are currently doing to try and bring the fire under control.